Innovation kicks into motion when you create the conditions for it to be unleashed in yourself and others. I use the metaphor of bringing the sandbox into the boardroom because a sandbox represents a space where, as kids, our imagination gave us free reign to dream, build, break down, and re-create. In the adult world of work, it represents a segment of time dedicated to being uninhibited and open to new experiences without preconceived ideas of what our play will lead to or how it will serve us. The boardroom can be an actual boardroom, or a training room, or a classroom, or any place in which we consciously choose to create an environment of safety, creativity, and freedom. We typically think of a boardroom environment as serious, focused, outcome-orientated… quite the opposite of what a sandbox means to us. So it’s a juxtaposition of two realities, a metaphor that represents a paradigm shift in how we need to lead and think and behave. I call it play-doh on steroids. The point is, bringing the sandbox into your boardroom doesn’t necessarily mean creating an artificial beach in the boardroom or lobby. It means creating the right conditions for fun and play that increase engagement, build skills, and ignite innovation specific to your and your business. There are four individual conditions you need to ignite the Sandbox in your Boardroom. 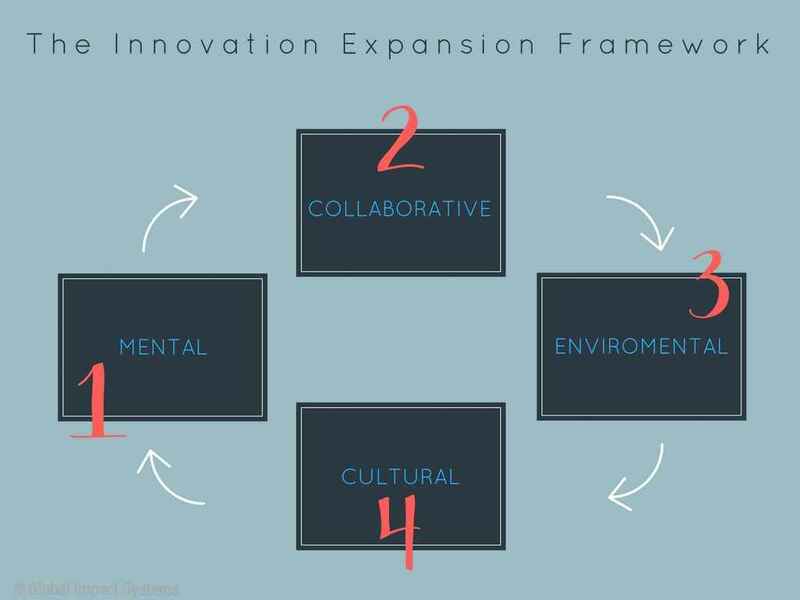 I call it the Innovation Expansion Framework. This is the mindset, the psychological shift that needs to happen for you as an individual, and for your team members, to enable you to learn, absorb, interact, respond, retain, and innovate from new information and lessons learned. Often, it requires you to change your perspective and view your current reality from a fresh lens. Children do this intuitively. Give them an old cardboard box and watch it open the door to endless hours of amusement and ideas for play for them. They have the ability to turn anything into a game and see old problems in a new way. You can too. Collaborative Expansion is how you interact with others to deepen your learning, spark new ideas, and sharpen your current processes. Interaction with others, facilitated in both unstructured and strategic, systematic ways, are breeding grounds for new thinking and fast-tracking momentum. Google conducted a study in which it found that its best performing teams acted as “safe spaces” where members felt comfortable sharing ideas without fear of rebuke. How are you creating safe spaces for teams to interact and collaborate with each other in your business? How can you level up in this area? This is the environment you create to support the skills you want to nurture in yourself and your people. When I visited a friend’s home yesterday and saw pictures of his parents and partner and kids displayed in beautiful frames on a mantelpiece, that told me that family is one of his core values. How does your work environment reflect your company values? When I walked into the Google campus and witnessed their bowling alley, meditation pods, dance classes, and slides employees jump on to take them from one floor to the one below, I couldn’t help but feel that the work environment was intentionally set up to support and nurture the creativity, well-being, balance, and flow of inspired ideas from the employees. Your work environment doesn’t have to be as distinctive as a Google campus. You may not have the space or the budget to be able to go town with elaborative toys, activities, and other perks to offer your employees. But with a little bit of creativity and thought, you can add a personal yet professional touch that ignites fresh thinking. Think walls in your brand colors, interesting accent pieces, or inspirational quotes, images, and wall hangings that reflect your corporate culture as starting points. Play and innovation need to be anchored into the heart and soul of your business -otherwise it will feel fake. To do this effectively, define a set of desired values and behaviors you expect from yourself and your team members. Align culture with strategy, processes. and brand, and get your people on board with the changes you are making. Put accountability structures in place and ensure they are measurable so you can clearly identify what’s working and where the pitfalls are. The four pillars of the Innovation Expansion Framework will give you the foundation to build a company that people are excited to work for; a place where individuals feel their professional and personal development is a high priority, where their contribution is valuable and integral addition to the effective functioning of the whole, and where the physical work environment is in alignment with the vision, values, and goals of the company. Implement the Innovation Expansion Framework into your business as a tool for aligning your people, performance, and productivity from the inside out. For a strategic implementation plan on how you can do this specific to your business, let’s connect.